Our Calendar lists a range of opportunities run by us and others for Essex Social Enterprises to learn and network. You'll find events specifically for Social Enterprises and for those open to all growing businesses. There are also online learning opportunities for you to learn from your desk. If you're running an event that can support Social Enterprises to learn and connect with peers, let us know. You’re invited to this FREE event from Essex Social Enterprise Network and SEEE, where you can meet other social enterprises, hear from exciting speakers and think about what you want from the network in the next 12 months. Last year Social Enterprises and supporters in Essex gathered for “A Bridge to Social Investment” and strong enthusiasm was demonstrated for the development of a Social Enterprise Network in Essex. 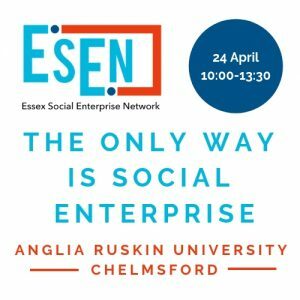 Since that time Essex Social Enterprise Network has been taking shape and we’re pleased to announce our next milestone event taking place on 24th April at Anglia Ruskin University in Chelmsford from 10:00 -13:30. Speakers will include John Niland, CEO of one of the leading social enterprises in Essex, plus a discussion with a number of local Social Enterprise leaders.There will be a sandwich lunch provided. Further details will be announced nearer the time. Places are limited so please book early to avoid disappointment. Please get in touch if there is anything we can do to make attending the event easier for you. © 2019 Essex Social Enterprise Network All Rights Reserved.